iPhoto 6 adds some terrific options to Apple's digital shoebox application, including better handling of Raw files, ColorSync management, and a non-managed library choice. Today I want to give you a brief overview of how Raw file editing has evolved in this latest release. First, let me describe how Raw file management worked before in iPhoto 5. If you had Photoshop selected as your external editor, double-clicking on a thumbnail from a Raw file in iPhoto 5 would open a Jpeg interpretation of that Raw file in Photoshop. You could edit this Jpeg and send it back to iPhoto by saving in Photoshop. If you wanted to work in Camera Raw, you had to drag a thumbnail from iPhoto 5 on to the Photoshop CS icon on your Dock (this worked only if you haven't edited the file previously in iPhoto 5) or export it as "Original" and open that file in Camera Raw. After editing in Camera Raw, you would click the open button to move the image to Photoshop where you could save it in any format you wished, or just hit save and choose your format there. You could then add the edited and saved PSD, Tiff, or Jpeg back to your iPhoto 5 library as a new image. In iPhoto 6, you now have the Use Raw files with external editor option in the Advanced Preferences pane (iPhoto > Preferences > Advanced). Using this option changes your workflow considerably. When the "external editor" box is checked, your double-click on a Raw thumbnail opens that image in Camera Raw (if you have Photoshop CS selected as your external image editor). Now, as far as I can tell, you can't "roundtrip" the changes back to iPhoto 6 just by hitting the "Done" button. But you can save to another format and import the edited Tiff, PSD, etc. back into iPhoto 6. So even though it doesn't technically "round trip" your Raw edits, this new method does save you a step... and is a welcomed improvement. If you want to edit your Raw file in iPhoto using the Adjust palette, you can go back and change the preference. But I prefer to leave the preference setting as it is and simply Option double-click to switch to iPhoto's editor, or CTRL-click on the thumbnail and choose either "Edit in a separate window" or "Edit using full screen." In my testing, I seemed to be working with the original Raw data using these options, opposed to building upon any instructions I've added using Camera Raw. Now, if I uncheck the Use Raw files with external editor option, iPhoto 6 behaves just as it did in iPhoto 5 -- I'm working with a Jpeg interpretation of the Raw file, and my changes are saved back to iPhoto 6. There's more to discover here, but I hope this gives you a good start with the editing options for your Raw files. If you would like my overall initial take on this application, take a look at iPhoto 6 First Impressions. "What's interesting though, is that iPhoto does remember your Raw adjustments made in Camera Raw. If you double-click the thumbnail again, it opens it in Camera Raw with your previous settings in place." Well, really is Camera Raw wich is remembering it's previous settings, but for the user the couple "simply works" ;). Now, if it will be working on the other direction it will be a complete solution! Two questions: does it apply to cameras whose RAW format is not supported by iPhoto (but is supported by Photoshop)? Is there a way to find out what RAW formats are supported by iPhoto on a continuous basis. (the latest Tiger upgrade 10.4.4 add some cameras but does not say which ones)? These pages tend to run a generation behind, but will give you a good idea of what Apple is working on. For example, if you see the Digital Rebel, then it's fairly safe to assume that the Digital Rebel XT is supported to, or soon will be. Also, keep in mind that the technical spec docs tend to trail the application release. So we should see more info in the coming weeks. 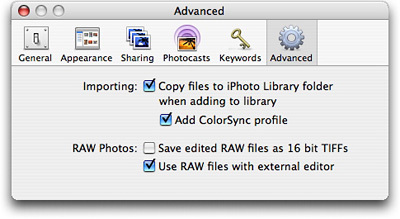 There may be a way to trick iPhoto into roundtrip conversion of RAW files. Launch RAW file from iPhoto to external editor; return to iPhoto and make some kind of edit to the file and save it (essentially letting iPhoto do an auto RAW conversion to JPG). What this does is create a JPG in the Modified folder in the same Roll as the original (but in its own folder). Now go back to the RAW conversion in your external editor do what you have to do and save the file as a JPG in the Modified folder for the same roll (you will actually be replacing the file created when you did the small edit in iPhoto). The advantage of using this roundabout way is that iPhoto will recognize your external edited file as the new version of the picture and you will even be able to use the Revert to Original function. It will also only show one file in the Library. Hi, I am importing my pictures from Canon EOS 350d in Raw format into iPhoto and edit them in Photoshop CS2. Instead of this complicated roundabout would it not be easier to first import the raw pictures into a "finder file" outside iPhoto, then edit them using Photoshop CS2 and Bridge and then import the final versions into iphoto??? If so, how to do that since I could not find any setting that enables me to import the picures outside iPhoto!!! Thanks for your suggestions! This is all so complicated. Why not just use the Picturelife app on iPhone or Mac, which allows you to store every picture you've ever taken, and click "share" to your linked social media accounts? The UI is far more intuitive and the app is way more robust.